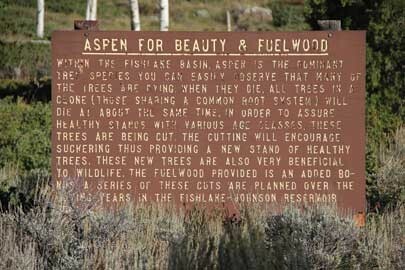 This story, written by Matthew D. LaPlante and Paul Christiansen, described the efforts to understand what is killing the aspen groves in Utah and won a AAAS Kavli Science Journalism Award in 2014. LaPlante is an assistant professor of journalism at Utah State University and a freelance journalist. Christiansen is a freelance journalist. Photo courtesy of the Salt Lake City Weekly. Image selected for replacement by Wibbitz; inline player will not be displayed. The AAAS Kavli awards recognize distinguished science reporting by professional journalists. This story won the Small Newspaper award in 2014. Photo courtesy of Salt Lake City Weekly. The irony is that Prometheus was not well known until it was destroyed. And the hidden pines—including one named Methuselah, for the figure from Hebrew scriptures who is said to have lived longer than anyone else in history—are largely unprotected from those who might do them harm every bit as carelessly as Sewell suggests. By contrast, just a few hundred miles to the east of the place where Prometheus long stood guard—and, it might be worth noting, at remarkably similar latitude—the Fish Lake clone stands, wide open, for anyone to come and see. And this comes with its own set of challenges. Visitors can camp here. They can start fires here. And there was a time not so long ago when campers were cutting down parts of this aspen clone for firewood. That’s what Michael Grant saw when he made his first pilgrimage to this place. That’s because it wasn’t. Not in the way that most people think, at least. Not in the way that just about everyone who ever went to science camp learned to age trees. Cut down any of this aspen clone’s stems—what researchers often call the trees’ trunks—and the rings inside might indicate that it first broke through the surface of the soil 100 years ago. Even the most senior stems in this clone were born after Utah’s Mormon pioneers arrived in the mid-19th century. Like the hair on a person’s head, new ones emerge as older ones die, but the forest remains. And this, Grant says, made the Fish Lake aspen clone rather uninteresting to many people—so much so that, rather than being aghast and contrite, as many were when Currey chopped down Prometheus, forest service officials were actually facilitating the fall of this clone. Grant also recalled that the clone’s stark stems had become a gallery of arborglyphs. The carvings, concentrated around campsites, were mostly names and initials. But there were also hearts and peace signs, scriptural citations and swastikas, happy faces and crude pornographic sketches. Each carving invited insects and disease. Soon, Grant came to see the clone’s broad anonymity as a threat to its safety. Even today, many of the autumnal visitors to this hallowed place are awestruck by the changing leaves—a fire in the trembling canopy—unwitting as to just how long it has been burning. And in 1992, Grant came upon a way to change that. Writing in the journal Nature that year, a team of Canadian and American researchers bragged that they had found the world’s largest singularly genetic organism—a 38-acre fungus growing on the roots of trees in Michigan’s Upper Peninsula. Not to be outdone, the U.S. Forest Service and the Washington State Department of Natural Resources countered with their own discovery—a 1,500-acre fungus south of Mount Adams in the Evergreen State, weighing in at an estimated 825,000 pounds. But bettering them all in Discover Magazine the following year, Grant laid out the case for Utah’s enormous aspen clone. With more than 47,000 individual stems and an interconnected root system that is even more expansive, the Fish Lake clone weighs an estimated 13 million pounds, Grant wrote. That’s roughly equivalent in weight to 35 blue whales—and some three times the weight of California’s largest sequoias, which are conventionally thought to be the world’s largest trees. And reasoning, as many conservationists have, that humans have a harder time destroying things that have been anthropomorphized, Grant gave the clone a name. A wave of media attention followed—most of the gee-whiz-isn’t-that-something sort that accompanies the biggest, oldest, shortest or smallest of anything. The ultimate impact of Pando’s publicity was uneven. The recreational firewood cutting stopped—officially, at least—but all these years later, there’s still very little that distinguishes Pando from neighboring aspen clones. Camping continues. So, too, does the wanton defacement of its sensitive bark. Among the initials carved into the trunks are plenty marked ’11, ’12 and ’13. It’s possible the dearth of public understanding and lack of political protection are related to the rather late-coming scientific surety as to Pando’s superlative qualities. For while Barnes’ 1970s estimate of Pando’s size certainly convinced Grant, there were plenty of questions left unanswered. It wasn’t until just a few years ago that Utah State University conservation geneticist and molecular ecologist Karen Mock began genetically testing aspens. She collected hundreds of leaves from Pando and sent dried leaf samples to USU and the National Forest Genetics Lab in Placerville, Calif. for testing. Mock was dubious of Pando’s purported reach, but to her surprise, the analysis confirmed a border area for one singularly genetic clone that almost exactly matched the one Barnes had drawn on a map more than 30 years earlier. Mock and her collaborators reported their findings in a 2008 article titled “Pando Lives,” published in the journal Western North American Naturalist. Barnes’ prescience, when it came to Pando’s size, lent new credence to another of his theories about the colony—that its large area might be indicative of a very ancient past. Based on the distinct appearance of the clone’s leaves and similar-looking fossils, Barnes also concluded it could be as much as 800,000 years old—an estimate that would put Pando’s birth alongside some of the earliest humans. More recent estimates have been derived from looking at the rate at which aspen clones spread their seeds. Declining fertility, researchers have found, can be connected to age. Still others have reasoned that the maximum known growth rate of aspen clones can be divided into a clone’s total size to give a minimum possible age. Popular opinion has coalesced around 80,000 years. It is, at best, an educated guess. 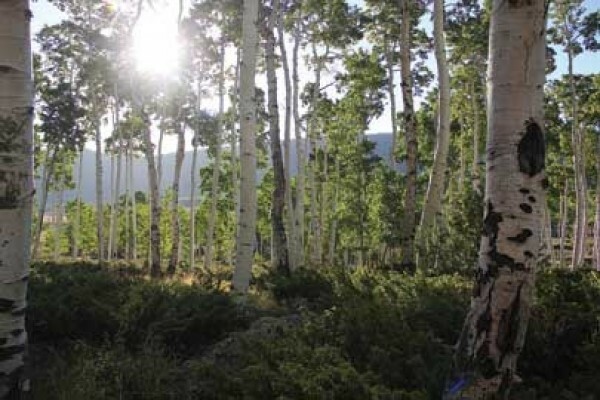 But if it is true, Pando is 16 times older than the oldest known bristlecone pines of California and Nevada. Generation by generation, human DNA has changed significantly in that time. But if Barnes, Grant and Mock are correct about Pando’s genetic uniformity—and there is little reason to believe they are not—the heritable material that is the basis for everything that is Pando has not changed at all. The code that was written when Pando was created—the very record of that time and place as expressed in an aspen genome—remains as it ever was. But now, finally, it might be coming to an end. It wasn’t long after Pando’s great size became a matter of genetic certitude that researchers began to notice something striking about the clone. 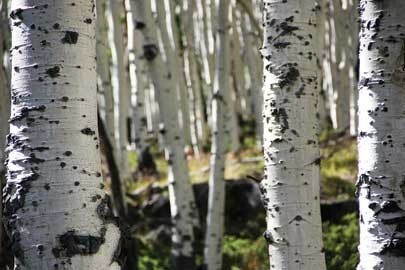 Pando didn’t appear to be impacted by the same sort of abrupt die-off, often called Sudden Aspen Decline, that had been observed in other colonies, but it was dying nonetheless. Mature aspen trunks last 100 years—200 at the very outer limits—before falling away as new growth takes over. In a healthy clone, the cycle is perfectly balanced, with equal numbers of juvenile, adolescent, adult and senior stems. 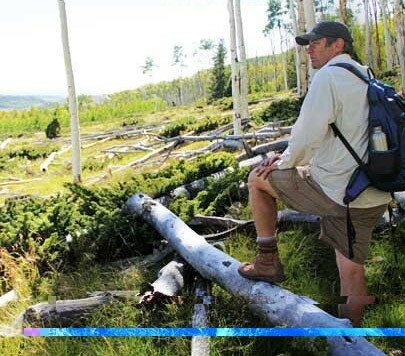 But when Utah State University wildland resources researcher Paul Rogers took a walk through Pando in 2010, he was alarmed at what appeared to be an almost complete lack of the younger generations. There’s little debate in favor of this being a healthy state for aspen—“no more than a human community comprised of all senior citizens would be,” Rogers says. It is possible, of course, that Pando has reached the end of its incredible life and is simply dying of very old age. By this line of reasoning, it is mere coincidence that humans have arrived just in time to witness its demise. Rogers, though, reasons there is a more direct cause. That ambition, though, poses a profound challenge: No one is yet certain what it is that has so grievously wounded this enormous, ancient being. After examining the clone a few years back, forest pathologist John Guyon sat down to list the potential causes of its demise in a letter to colleagues at the U.S. Forest Service. Like a geriatrician chronicling the symptoms of a long-suffering patient, Guyon noted Pando was suffering from boring insects, bark beetles, canker infections, bark rot, leaf diseases, root decay and fungal attacks. That’s likely just the beginning, Guyon says. Aspen, he noted, thrive in the midst of disturbance. Cut down a clone’s stems, and a healthy aspen root system will send up many more in replacement. Allow a fire to rage through a colony, and new suckers will often follow the path of the flames. Or, at least, it long has been. In recent decades, with homes and cabins scattered across one of the state’s favorite recreation areas—including some dwellings situated within the clone’s boundaries—state fire managers have not been prone to sit idle. That is not a phenomenon limited to Pando. “You have a bunch of aspen forests throughout the West where there have not been anywhere near as many fires as there used to be,” Guyon says. Climate change has likely played a role as well—and if it hasn’t yet it almost certainly will, according to a joint research effort from the U.S. and Canadian forest services. In an elegant study that plotted changes in climate against forest health, the collaborators demonstrated that regions that have been impacted by the most drastic aspen die-offs were closely aligned with areas that have experienced hotter temperatures and drier winters in recent years. The implication, the scientists concluded, is that aspen woods might be more precariously balanced than many believe—and small changes in climate in coming years could result in even more drastic die-offs. In September, following an afternoon hike through Pando’s western stretches in an unsuccessful search for any new growth, Rogers stopped on a hillside overlooking one of the most brutally devastated stretches of the Pando clone, where recently fallen trunks far outnumber those that remain upright. He raised his hands in exasperation. “Given everything we know about everything that’s going wrong, where do we even start?” he asked. At least for now, the answer to Rogers’ question is right down the hill. That’s where the U.S. Forest Service has erected a fence around dozens of acres of Pando’s eastern woodlands. The fence—a $50,000 testament to Grant’s vision that making Pando famous might secure the funding needed to help save it—comes in response to yet another theory about what is killing the clone. Young aspen leaves are a favorite snack of the elk and mule deer that graze in this region, and the fence is intended to help protect whatever young stems breach the surface. This has been tried, on a smaller scale, in the past. But falling trunks from the dying clone breached the fence and, within days, years of work were ruined. “It was like a salad-bar buffet,” Rogers says. Aside from hunters, Utah’s 60,000 wild elk and 350,000 deer have little to fear. Their chief natural predator, the once-statewide population of gray wolves, has been hunted nearly to extinction. Better monitored, this time around, the fence might give young stems a shot. But while that might buy Pando some time, it’s not a scalable option for other aspen clones. And ultimately, given the perfect storm of pressures Pando faces, no single action can guarantee the clone’s future. But on the day after standing over Pando’s dying southwest corner, Rogers was inside the month-old fence, marveling at growth he hadn’t seen in these parts for years. In those moments, he was not a scientist. Not a conservationist in mourning over this beautiful forest. Not a man trying to turn back time. He was a boy at play in a hundred-acre wood. And that’s the sort of thing that lives forever. You may view this story in its original format at the Salt Lake City Weekly.